Japan Ryokan & Hotel Association Kansai. How to Use a Ryokan. 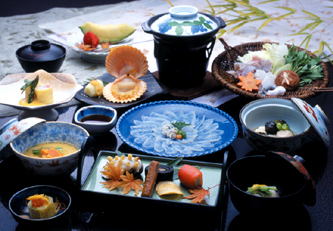 Dinner at a Japanese ryokan is generally a course menu of washoku (traditional Japanese food). Each dish is extravagantly prepared, using plenty of seasonal ingredients all so beautifully presented that it will fill you with admiration for a while. The Japanese food served at a ryokan is prepared by master chefs specializing in Japanese cuisine. These maestro, after many years of apprenticeship, have passed the national examination to become licensed cooks and now practice their art in ryokan, just like those working at traditional Japanese restaurants such as ryotei or kappo. Chefs with outstanding skills are responsible for passing on the tradition of Japanese cuisine, and serve dishes which delight the eyes and palate of customers. At a ryokan, meals are generally taken in the guestrooms. The attendant will politely explain about each dish as she serves the food. Here, you will be able to fully enjoy the skills of Japanese cuisine which cannot be experienced even in Japanese homes. The various dishes of your dinner will be brought to your guestroom by the room attendant. They will be served at the best temperature for each of the dishes, in other words, hot dishes will be served hot, and cold dishes will be served cold. The Nakai-san is always attentive and aware of the pace at which the guests are dining, so that she can serve dishes at the perfect timing, in close collaboration with the kitchen staff. The rolls of the kitchen staff are clearly defined. Served at the best temperature! The 'Nakai-san' is always attentive and aware of the pace at which the guests are dining, so that she can serve dishes at the perfect timing, in close collaboration with the kitchen staff. The attendant will politely explain about each dish as she serves the food.